The American-Arab Anti-Discrimination Committee (ADC) is outraged on President Trump’s proclamation that effectively expanded and further entrenched the Arab and Muslim Ban. There is no set expiration date for the Arab Muslim Ban 3.0 and the language articulates indefinite implementation. At 3:30pm on September 24, 2017, the proclamation was issued as the travel restrictions on the nationals of Iran, Libya, Somali, Sudan, Syria, and Yemen were set to expire. The proclamation enacted detailed restrictions on Chad, Iran, Libya, North Korea, Somalia, Syria, Venezuela, and Yemen. 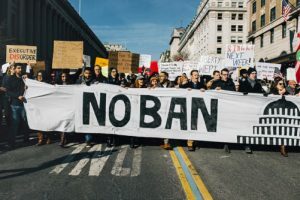 The proclamation applies immediately to individuals seeking visas who are covered by the Second Muslim Ban and who lack a credible bona fide relationship to a person or entity in the United States. For all other persons – including nationals of Iran, Libya, Syria, Yemen and Somali who have a bona fide relationship to the U.S., the proclamation applies beginning October 18, 2017.